an abbreviation of Veld Koning Machine Factor. At first, the company specialized in heavy equipment for mining and agriculture until 1967. At that time, they started manufacturing amusement rides with their first Ferris Wheel. In the late 1970’s, Vekoma entered a partnership with Arrow Development out of Mountain View, CA. 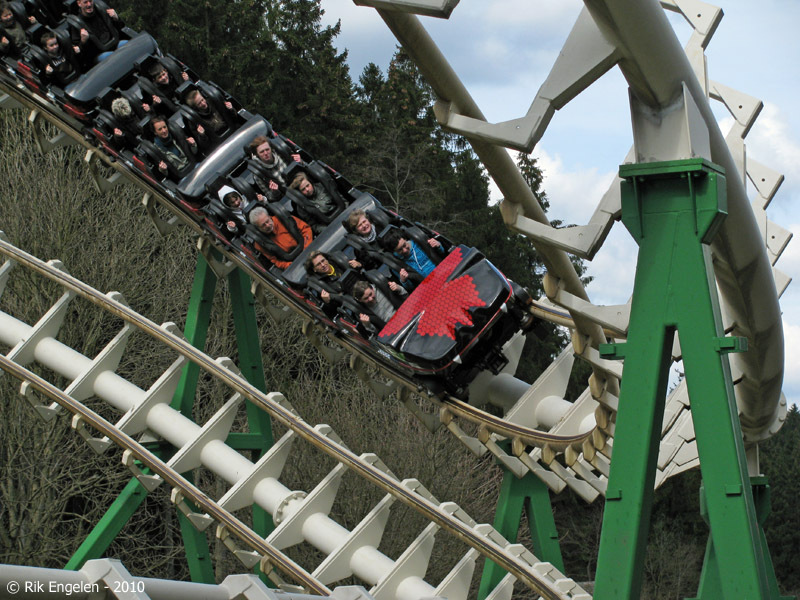 In exchange for purchasing Arrow rolling stock for rides, Vekoma would have access to the Arrow designs, leading them to design their own version of the Arrow track. 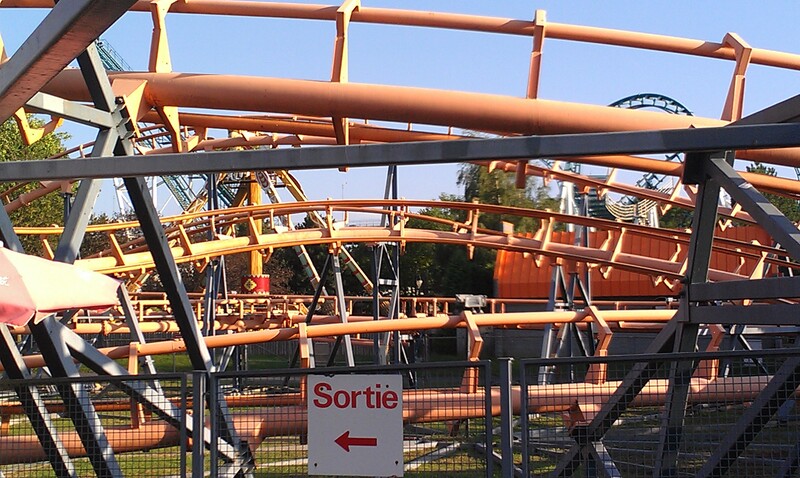 One notable difference between Arrow vs. Vekoma is in the track ties from the support spine to the running rails. A second would be in the connection systems: Vekoma rides are bolted together, while all the older Arrow rides were welded together in the field. The MK-1200 model name refers to the track gauge (width between each rail; 1200 mm or 47.24 inches in this case). 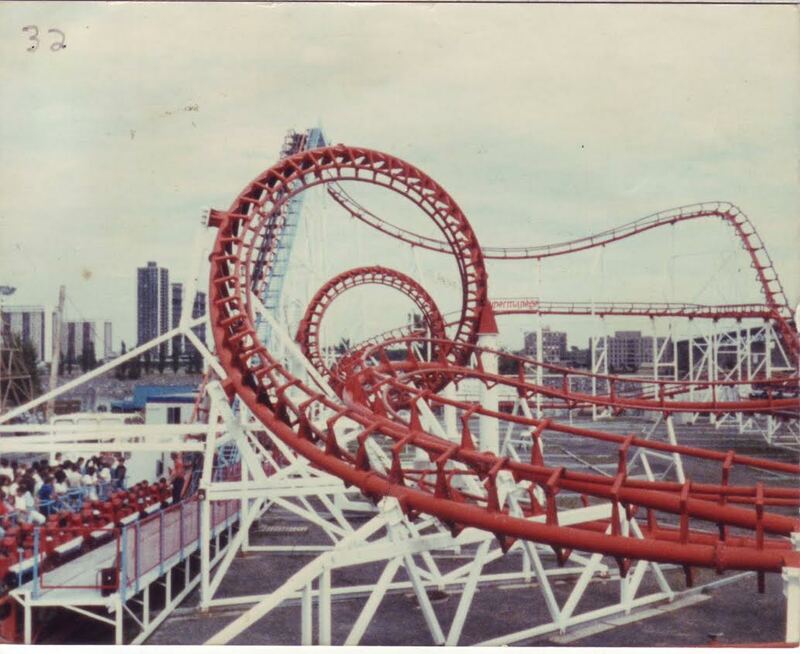 1979 brought the first Vekoma coaster, an adaptation of the Arrow Corkscrew and sold under the name “Corkscrew with Bayern Curve”. Unlike the Arrow version that consisted of a small, permanent layout with poured foundations, the Vekoma was originally intended to be a portable ride mounted on a steel frame. Only one of those rides was ever used in a fair. “Super Spirale” only operated for one fair in august 1979 at the Annakirmes Fair in Duren, Germany. Immediately after Oscar Bruch and Fritz Kinzler sold the ride to Traumland Park in Bottrop, Germany. It opened in September 1979, closing sometime in 1986. 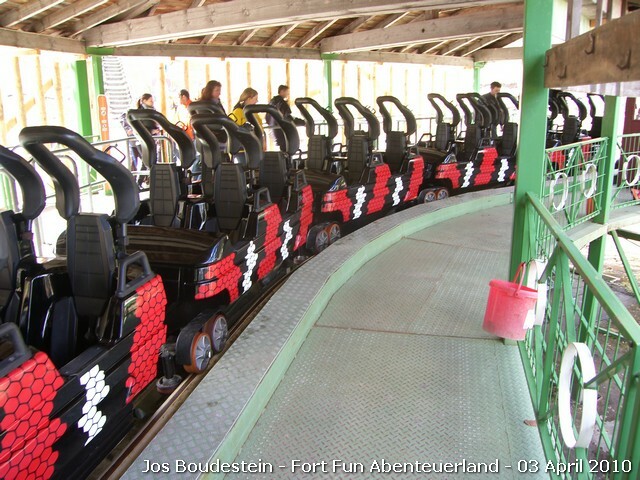 The Vekoma prototype was presented as “Tornado” by Walibi Wavre in Wavre, Belgium. 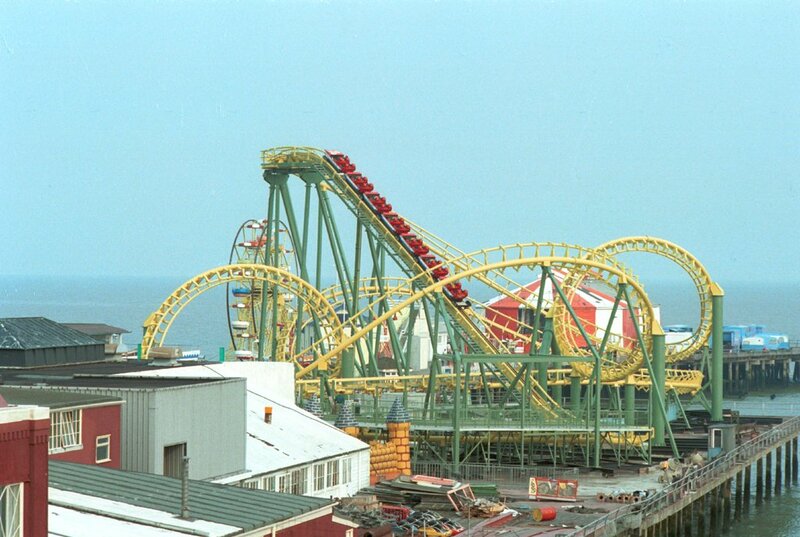 Owner Eddy Meeus took a large gamble when he opened the first ever looping coaster in Belgium and this was shortly after Pleasure Beach at Blackpool (England) opened Revolution, a Arrow shuttle loop model. Schwarzkopf debuted the Looping Star in 1978, a portable single loop coaster on the German fairground circuit. It was a true revolution, but many parks were skeptical of the impact of the ride at first. Walibi Wavre, Holiday Park (Hassloch, Germany), and Pleasure Beach all gambled- installing looping rides and it paid off. A “looping craze” rolled across Europe and quickly all parks joined in on the new wave of excitement. 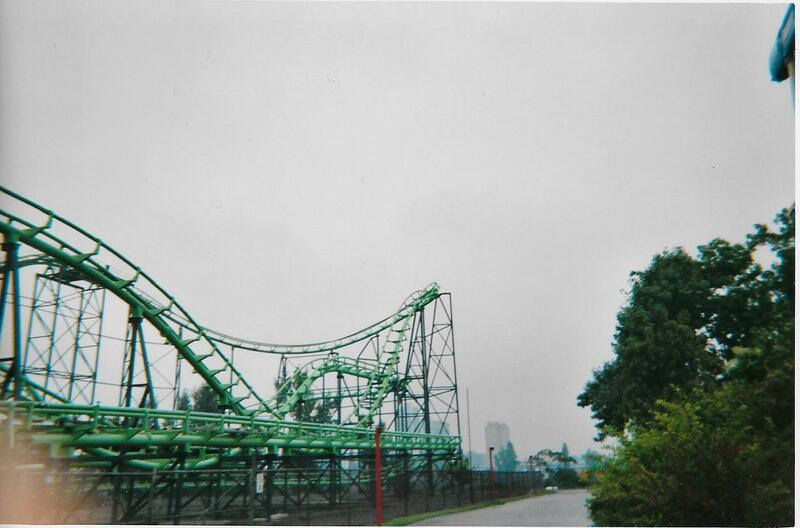 This is the Tornado at the then Six Flags Belgium in 2001. By that time, the ride ran only a single train. The Corkscrew with Bayern curve feature a very compact 312 feet x 164 feet layout with a 75 feet tall lift hill and the station on one side of the ride. After the steep lift hill, the train leveled off to disengage the lift chain and then dropped on the right before making a rising right turn into the ride main drop. Standing at a respectable 68 feet tall, it dropped at a 45 degrees angle and featured a sharp negative G moment at the top for the back car riders. 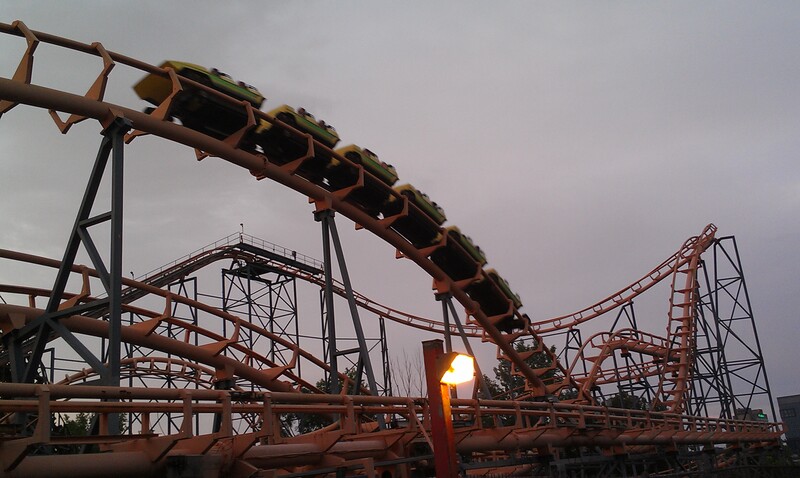 The Arrow 6 cars looping train then rose into a hill that lead to a banking right hand curve that lead to the ride signature element: the Double Corkscrew. The Corkscrew was very well engineered for the time and the train navigated it smoothly. This picture show the Super Manege at La Ronde with its original colors. The picture was taken by Steve Lecours in 1990. Le Super Manege was repainted green in 1999 and it stayed in those colors until 2001. This photo show the second corkscrew and the lift hill. The first Corkscrew. Notice the supports that go over the loading area and the update paint scheme. 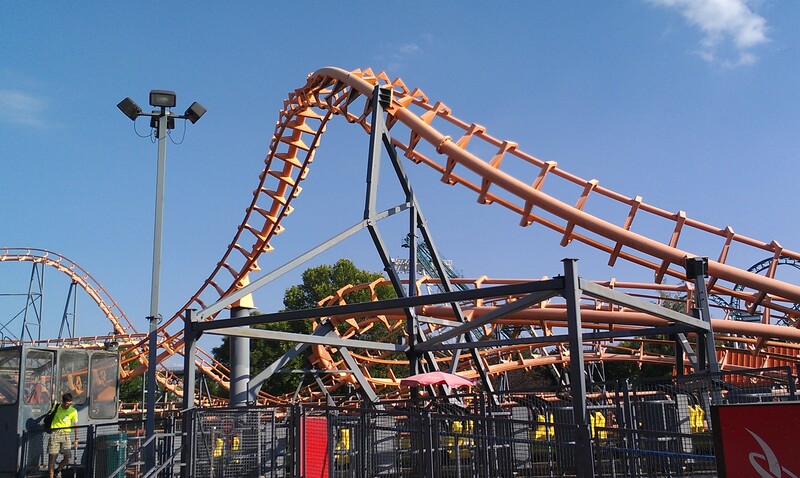 It was repainted by Six Flags in 2002 to Orange track and grey supports. After the Corkscrew, the train rise to the right under the lift and higher turn. It turns again to the right to be parallel to the first drop. A small section of curve track can be equipped with a speed reducing trim brake, but most parks opted not to install it. Another sharp turn lead to the “Bayern Curve”, which is a convoluting 540 degrees helix. After the helix, the train go over a small hill that bring the cars under the lift hill and then the train turn to the right before rising into the brake area, which form the outer “layer” of the ride. The ride then went around a turn into the second braking area which was the holding spot for the second train. The Bayern Curve as seen from the station. 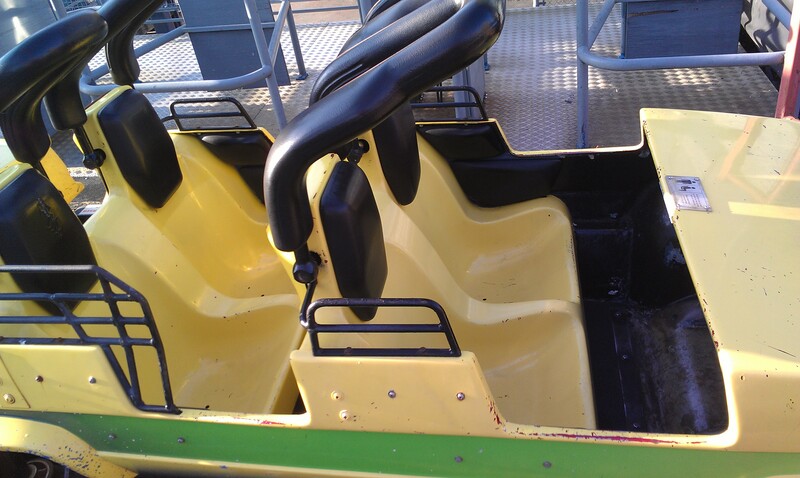 Due to the strict space requirements for the ride, there was no space for a full size sliding transfer track. So, Vekoma invented a new method that revolutionized future roller coaster installations and that was a rotating track section. One side of the track is straight and is used for every day operation. When the spare train needs to be added or removed, the train is stopped at the holding area. The track piece is rotated and now forms a small curve that goes under both track sections and lead to the transfer track which is inside the ride. A winch is installed at the end of the transfer section and the train is pulled back and then secured on the flat transfer track. After the train is in place, the track section is rotated back into place. In the case of the Corkscrew, the rotating track switch is located right after the set of trimming brakes at the end. Another innovation was the station arrangement. The station is at a small downhill inclination. The lift chain extends into the station and thus, there are no risks of the train miscatching the chain due to over speeding, which can happen on some Arrow rides. To make the ride quieter and also to prevent the second train from catching on the chain when it comes in, a steel guard come up and prevents the chain dogs from touching the chain. This is the front of the train in the station. Note that the bar on the right of the chain is not a restraint release. It is the bar that keeps the chain dogs raised when the second train pulls into the station. 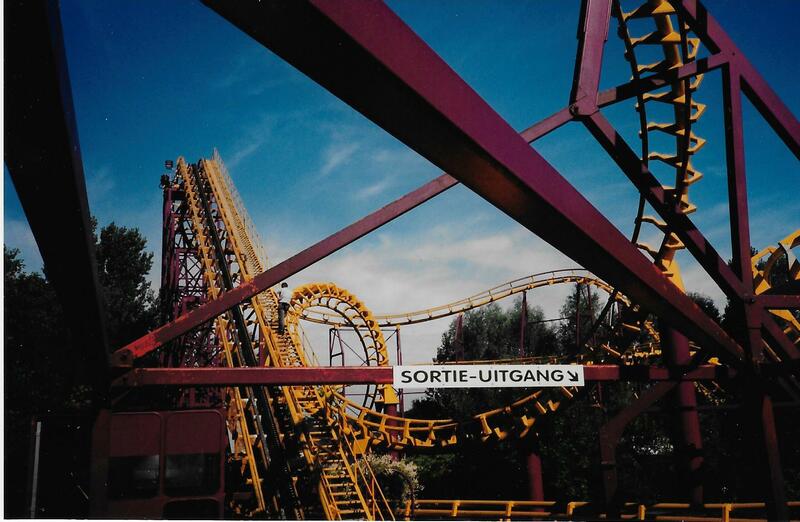 Those pictures show the layout from the right side of the Super Manege at La Ronde, a 1981 installation of the Corkscrew. 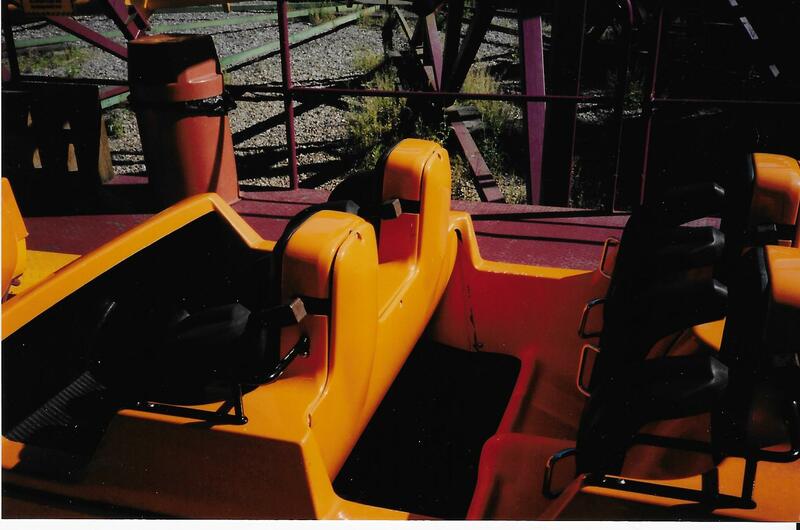 Original Arrow train with the large head cushion and smaller over the shoulder restraints. 1981 saw Vekoma licensing a model from Arrow. 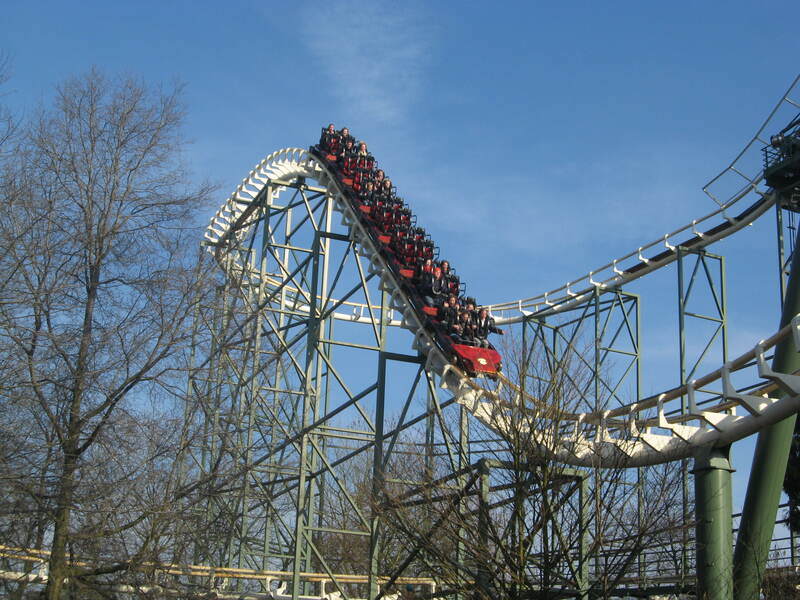 In 1980, Arrow Development designed and built the Carolina Cyclone at Carowinds (Charlotte, NC), which was the first roller coaster with 4 inversions. 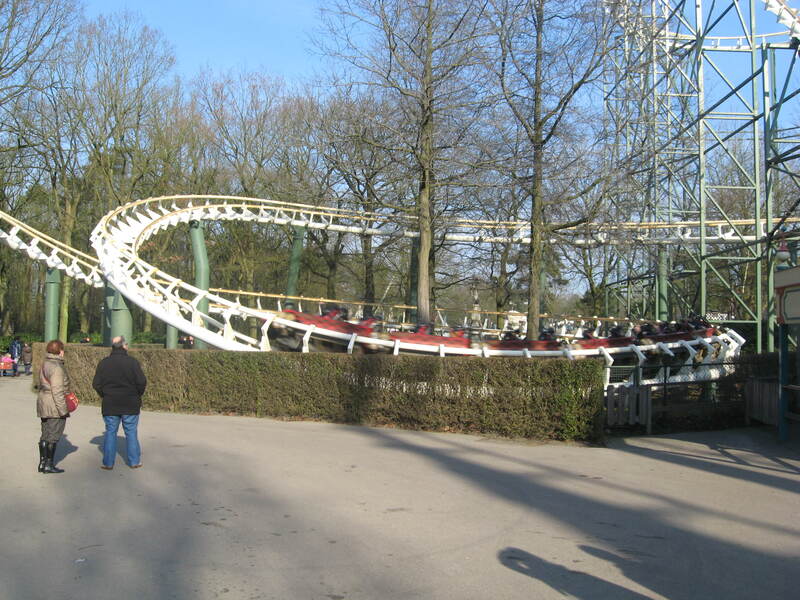 So in 1981, Vekoma adapted the Carolina Cyclone layout for the new “Python” at Efteling (Kaatsheuvel, Netherlands). The same model was sold to 3 other parks in Europe and South America. 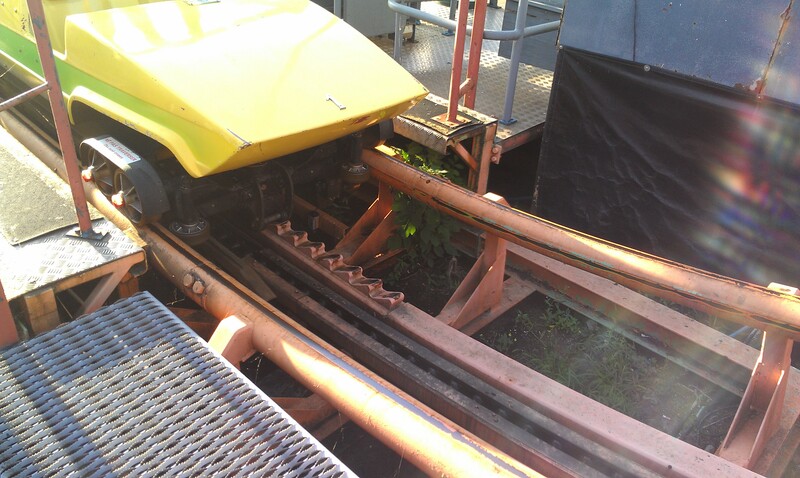 Lift hill on the Python. The first drop. At the time of my visit in 2011, the train operating on the ride was from Kumbak, another company. In 2011, those trains were replaced by new Vekoma MK-1211 rolling stock, which we will discuss later. Final helix of the ride. 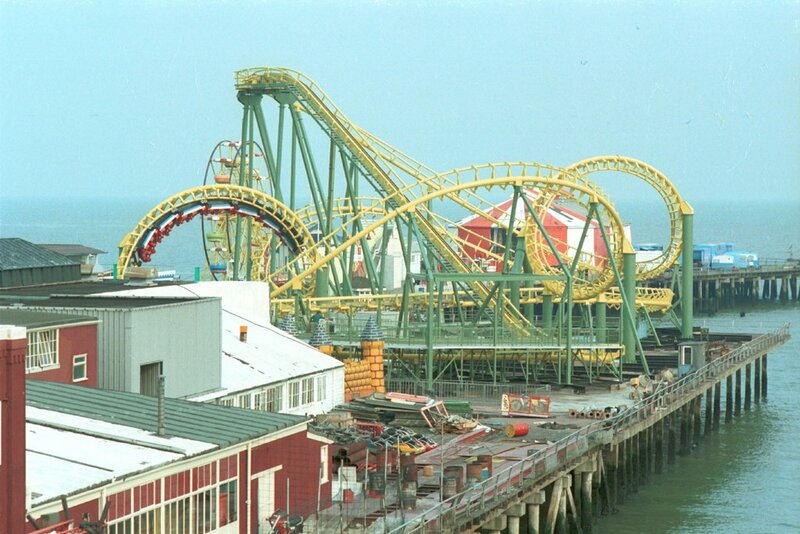 1981 also saw the launch of a very compact roller coaster. The Whirlwind model has a small 64 feet tall lift hill in the middle of the ride and a curved station to save space. After the lift hill, the ride immediately drops into a single Corkscrew. After, a right hand banked turn lead into another single corkscrew and then another banked turn into the brake run. The prototype went to the Hollywood & Safaripark Stukenbrok park (Stukenbrok, Germany) and a further 6 rides were produced between 1981 and 1984. Due to their compact size and ease of construction, quite a few of those travelled around the world. Like the Corkscrew, the ride is mounted on a steel frame and in this case, the counterweight is mounted in the center of the ride and the frame branch out. Interestingly, the original model showed at IAAPA Attraction Expo by Vekoma showed a transfer track and two trains operation, but the actual production model only ran one train. This installation shows the benefit of the steel frame structure. This model was installed on a pier out at sea that made traditional footers impossible. It operated as Whirlwind at Clacton Pier (Clacton-On-Sea, UK) from 1983 to 1985. 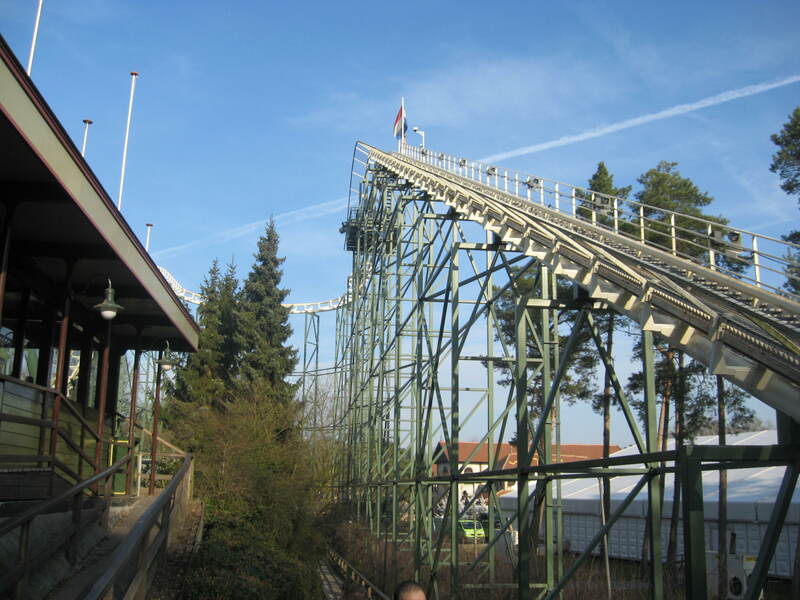 This scale covered first generation looping Vekoma train run on the Speed Snake at Fort Fun Abenteuerland (Wasserfall, Germany). Those trains will further elaborated on in the next part of this serie. This is the Tivoli Park Whirlwind at its original home. This PDF show two good early pictures of the Whirlwind. I would like to thank Vekoma for providing the above media. This entry was posted in Coasters, Industry Profile and tagged Bayern Curve, Coaster, Corkscrew, La Ronde, Looping Coaster, Rides, roller coaster, six flags, Speed Snake, Vekoma, Whirlwind. Bookmark the permalink. Hi, I am very familiar with the Whirlwind that operates in Brazil. 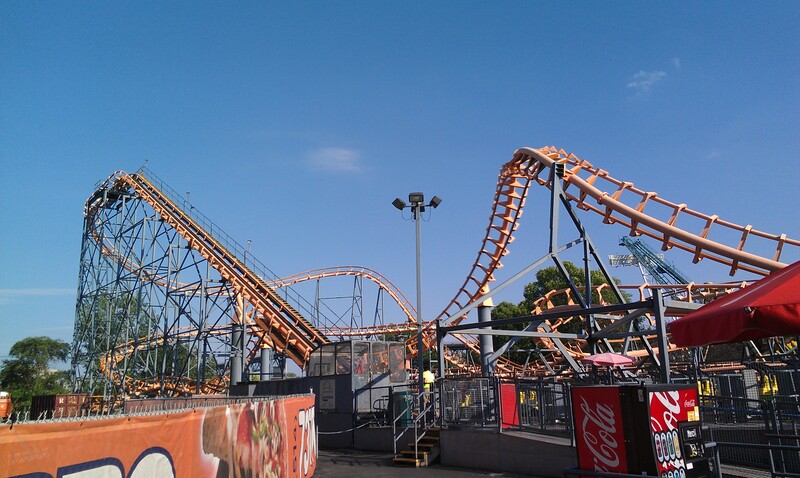 I’ve known it since it opened at Tivoli Park and I’ve rode quite a few times since it opened at Mirabilandia. I can assure you that it doesn’t have a transfer track and it has always operated with a single train. There probably has been some confusion when Vekoma gave you this information. The first time Vekoma introduced the model at IAAPA Expo, the miniature showed the two trains and the transfer track, but the next year, they re-introduced the model, this time with a single train and no transfer track. The one in Brasil never had two trains or transfer track..